It posits that a probably innocent man is kidnapped by the United States and sent to another country for interrogation involving torture. Reese Witherspoon plays his tormented wife and Jake Gylllenhall plays a CIA analyst who overseas the interrogation to his horror. Both well-known actors cut their usual fees to perform in this movie. The script tries to hit all the leftist notes about the evil lengths our government will go in the “War on Terror.” It cost just south of $30,000,000 to make. Its cast is a roster of famous names including Meryl Streep. Given its topic, its advertising, its wide release on 2,250 screens, and blatant appeals to leftist sensibilities, you’d think it would be burning up the theaters. It’s been out for two weeks and its made about $7,800,000. The re-issue of Tim Burton’s “Nightmare Before Christmas” has made more money. I hold no brief for the government and realize they make mistakes and do bad things sometimes. However, I’m put off by “America the Bad” messages. How about showing the good our nation has done in the world? How about showing the evil things other nations and groups do (airliners v. skyscrapers ring a bell)? I don’t know when Hollywood will get the message, but keep voting with your feet. The other day, Say Uncle did a show and tell on his Ruger 10/22 rifle. He was responding to Bruce of No Looking Backwards (I still call his blog mAssBackwards) who realized that October 22 would be a good day to show his and others Ruger 10/22s. I would love to show you my Ruger 10/22, but I can't. I have a confession to make. I don't own a 10/22. I've got a Remington FieldMaster pump-action .22 rifle. Yosemite Sam has a semi-auto Sears .22 handed down to him from his father, but neither of us has a Ruger 10/22. Is that a gasp of amazement I hear out there? No, it's a gasp of amazement coming out of me. The 10/22 is a fine rifle and belongs in any gunnie's collection. One of these days I will have to buy one and thus end my shame. I posted about a Gallup Poll last week that showed that support for rights to own handguns is the highest it’s ever been since the question was asked. In 1959, only 36% of people polled supported handgun ownership and 60% would ban handguns for “ordinary” citizens. This has puzzled me since I wrote it. 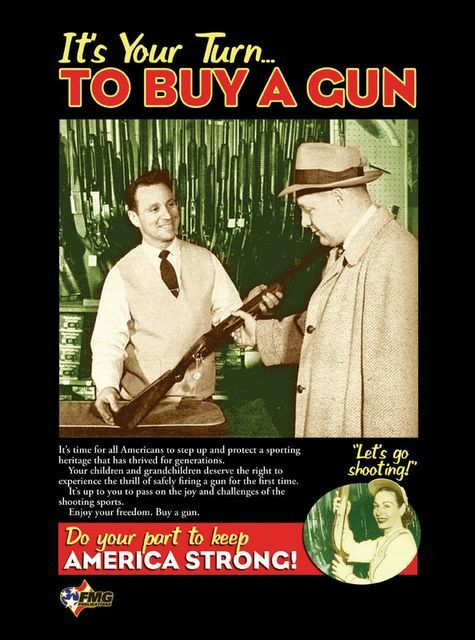 We view anytime before 1968 as being a Golden Age for gun rights. In terms of formal laws I guess it was. You could buy a gun in a hardware store with no questions asked. You could order a 20mm Solothurn rifle from a magazine advertisement and the U.S. Mail would deliver it to your door. There seemed to be less crime then even though guns were more available. Now we have organized groups who want to ban guns and legislators who try to make this happen. We must undergo an FBI check to buy any firearm. We have gun crime at a higher rate than in the 1950s. One would think that the poll numbers would be reversed, but they’re not. I think there're a few reasons for this. First, some (not all) World War II veterans came home with little use for handguns. Most of them had been trained as riflemen first and foremost. The rifle was your best friend—if you were infantry. In fact, some military planners hoped the M1Carbine would replace handguns. I can give one example of veterans having little use for handguns. My father flew bombers during the war and was issued a Colt 1911A1, which he carried in a shoulder holster. He told me that he could have kept his pistol, but he was tired of carrying it. To this day, he’s never had any interest in handguns although he owns rifles and shotguns. If veterans with this attitude had been polled, they might be part of the 60%. Second, you didn’t have the very real threat that your handgun and maybe gun rights could be taken away. Such a thought was “pie in the sky” at best. A person who didn’t like handguns might agree to ban them in a poll believing such a thing was impossible. That same person might give a different response if they felt it could actually happen. It’s part of mankind’s paradoxical nature. Third, gun control may have been in the air. Most of our gun laws were passed in 1968, only nine years after the 1959 poll. That’s not a lot of time. During the 1960s we had terrible political assassinations using guns. These events may have consolidated a feeling that already listed. I’ve done little research into public opinion in 1959. I’m flying by the seat of my pants here and could be all wet, but maybe not. The Ten Ring reached a blog milestone sometime this weekend. I checked Sitemeter and found 225,347 hits. That may be what some of the big bloggers to on a good day, but it feels good to have had that many people check into our blog. Thanks to all those who came in for a visit and another thank you to those who keep coming back. Wow, two posts in one day--must be a slow day at work. Anyway, I checked out a couple of blogs this morning and noticed some good news from the wonderful people of Gallup Polls. Arms and the Law mentioned that fewer Americans support gun control after 9/11. Call Me Ahab discusses the numbers in more detail. And they are good news for us--the Brady Bunch must be crying in their corn flakes. I took a closer look at some comparisons with past and present support for handgun limitations(here's the link and scroll down to Number 21 about 2/3s of the way down the page). There's something that jarred me. Today, 68% of the people believe there should not be a law limiting handgun possession to police and other authorized people. That leaves 30% of Americans (with 2% on the fence) that would infringe on our rights. Surprisingly, in 1959 the numbers were almost exactly reversed; 36% of the people thought that handgun ownership should not be limited to police and other people while 60% would ban handguns for the average citizen. In fact, since 1959 public support for handgun ownership is the highest its ever been tracked by Gallup. You could've knocked me over with a feather. I try to keep concentrate on gun issues, but every now and again, I have to expand the blog's horizons. I'm here at work and I was doing some morning news reading (don't tell the boss). I read an article in the New York Times that discussed the affect more immigration enforcement was having on a large meatpacking plant in North Carolina. The author is Stephen Greenhouse and he laments the impact this enforcement has had on the employer and the illegal immigrants. Greenhouse tells us sob-stories about Hispanic themed stores having less business, about a woman whose husband is facing deportation, about how illegal aliens may have helped formed unions, and about how they were harder workers than Americans who replaced them. I don't know about the work ethic part of it, but the article mentions a lot of good news couched as bad news. Here's an example, "Some companies have reluctantly raised wages to attract new workers following raids at their plants." The key words here are "reluctantly" and "following raids." The good news is that companies raised their wages. I thought this was a good thing. Greenhouse goes on to complain about a woman who now works at the meatpacker and faces a long commute in a company van (she pays a weekly amount to ride it). I don't like my long commute, but this woman more than doubled her hourly wage. That's not a bad thing. Further, Greenhouse had to admit that the plant has hired more black people to replace the illegal immigrants. The plant has a high turnover rate and new employees complain of sore muscles. But, there's no guarantee that work will be easy or even rewarding. Someone must do the mind-numbing hard work and we all can't get paid to discuss Jacobean poetry. I am amazed that a New York Times writer could try to turn good news into bad (that's called sarcasm people). From Arms and the Law I see that a Federal judge has struck down an Oklahoma law that ruled companies could prevent employees keeping a gun in their cars if parked on a company lot. I admit to some mixed feelings about this, as did some of you who commented on the post. Private property should not be subject to arbitrary government rules. I didn't like the state of Massachusetts saying that I had to have a gun license to keep my own gun in my own house. Believe me, that law and virtually all of Massachusetts’s gun tyrannies sucked. The more I have thought about this, though, the more I have to come down on the side of Oklahoma's legislature. Here's some history. A few years back large employers like Weyerhauser and ConocoPhillips decided they wanted to prevent gun violence in the workplace. They knew that some employees had carry permits and others brought guns to work in their cars during hunting season. They used obscure parts of employee handbooks to order surprise inspections of cars belonging to randomly selected workers. If you refused a search, you were fired. If they found a gun in your car, you were fired. It affected a number of employees regardless of how well they performed or how long they had worked for the companies. Oklahoma lawmakers thought this was unfair and that it violated the Second Amendment. They passed a law to stop this practice, the same law that has been struck down. Of course, the state could appeal, so the story is not over yet. As I said, I've thought about this and I must come down on the side of being able to keep a gun in your own car even if it is parked in a private lot. Especially so the lots of huge private bureaucracies employing thousands of people and that may be the only employer of note in a city. There's no comparison between a huge company and a homeowner. My car is an extension of my home. If I visit a gun-fearing friend and I'm carrying a gun, I will respect his wishes and lock my gun up in my car even if it is parked on his driveway. While he owns the driveway, I expect to be able to store my gun during the visit. If I visit a small store that has a no guns allowed sign, I also expect to store my gun in the car parked in that store's parking lot (ignoring the fact that I probably wouldn't shop there in the first place). If we allow anyone to state that you can't have a gun in your own car while it is parked in their lot or driveway, we make our self-defense and gun rights meaningless. You won't be able to run a few errands while carrying a gun. You won't be able to stop at a store and buy supplies on your way to a hunting spot. You won't be able to store your gun in your car while you're at work and then holster it after work. If enough businesses promulgate such rules it will become impossible to carry a gun for self-defense no matter how many permits you have from state governments. My property rights do not end when I park my car in someone's lot. My Second Amendment rights do not end just because a private party wishes them gone. My right to self-defense does not end because some private nanny wants me to be defenseless. I will cede this though, I think a company, store, or person does control what happens inside their buildings. Carrying a gun when they wish you to refrain does violate private rights. Storing a gun in your own car even in their lot is not the same thing. I hope that this decision is reversed. Via Kim and Say Uncle, we have the story of Ronald “Bo” Ward, an owner of a barber shop who needed a zoning variance in order to stay in business. His request was denied and Mr. Ward exclaimed “Ya’ll have put me under ... I’m out of here,” and then shot himself in the head. On the surface, most people will say: That seems to be an extreme reaction to a minor setback, but the first thing I thought was that I'm surprised this doesn't happen more often. You see, I work in the land development field and I deal with these zoning boards all the time. Massachusetts zoning boards. Massachusetts has 351 towns and each town has different rules and requirements for zoning. Thus, we have to keep track of the rules in every town in which we do business. This doesn't even take into account the restrictions caused by various environmental regulations like the River's Act. All that is bad enough. But now we get to the real fun. For example, a client wants to add a pool to his property in one of those W towns in the western suburbs of Boston. OK, this shouldn't be too hard. Look up the Zoning rules for the town, check if he has wetlands on his property, apply the rules and regulation, design the pool accordingly and then we're done. We go to the board and the board mentions that our client's house is on a Scenic Road and that his landscaping needs some work. Well, I can't seem to find the zoning rule that mentions landscaping, but the client agrees in order to work with the board and to facilitate approval of his pool. Now the board has issues with our client's lighting. Lighting that can't even be seen from the road. The board wants low environmental impact lighting with a low wattage. Now our client is getting pissed. He wants to get his pool built before the end of summer. We draw up lighting plans that show the negligible impact of our client's current lighting arrangement. The board still wants the low impact lighting and now wants tighter development restrictions on our client's property. Restriction that would guarantee that our client would no longer be able to add improvements to his property. Now you might say: Why doesn't our client sue the town? Well assuming that our client has enough funds to afford a long, protracted law suit, the outcome would still be far from assured. The town doesn't care, they have a nice tax base to defend any potential law suit. So our client finally gives up and decides to try again later, even though, according to the town's zoning rules and regulations, he had a legal right to build a pool on his property. This is arbitrary government at its finest. I have seen scenarios like the one outlined above, over and over. It does not surprise me in the least that a few people reach their limit and push back. Well, here it is almost a week since my last post. I've promised myself to do better. I really have. Honest. Good thing I haven't promised that publicly...D'Oh! I have an excuse. I've been in a pharmaceutical haze for much of the week. There's a good reason. I was at work doing a collateral duty (workspeak for something that isn't in my job description, and for which I have absolutely no training, background, or experience). I helped a co-worker lift a few heavy things and then bent over to pick up a roll of shrink-wrap. Bam, my lower back spazzed up and I went limping around for a day and a half. I said a day and a half because the people I worked for told me to walk it off and do my regular job. Yeah, okay, fine. When the pain got too bad, I told them I needed to see a doctor and they agreed, finally. I found out that I had a lumbar back spasm. A real doozy too. No real damage, just a lot of pain that caused my toes to tingle and not in a good way. The doctor prescribed Flexeril to relax my muscles and Vicodin for pain. Now, this is only the second time I've ever taken anything with opiates in it (Vicodin). The first was in a cough syrup when I had a lingering flu. I have no tolerance for anything stronger than Tylenol. I spent the next four and a half days off work including Saturday and Sunday. Now normally I'd be celebrating days off by heading to the range or doing something else fun, but oh no I spent those days, including my sacred weekend, sleeping on the couch, in the bed, in my dinner plate, and everywhere else in between. Poor Yosemite Sam didn't know what do to. He wanted to go shooting on Sunday, but said he wouldn't really want to see me falling asleep with a gun in my hand. So poor guy ended up in the house all weekend with me sleeping, the dog farting (nobody ever told us that Basset hounds pass a lot of gas), and the cat crying for food. Boring. I'm recovered now. The muscle relaxant did its job. Now I want my weekend back.